Five students and one former postdoctoral fellow were recognized for outstanding achievements at the recent Department of Mathematics annual awards ceremony. 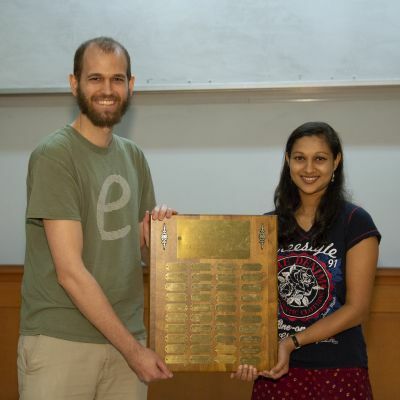 The 2018 B.F. Bryant Prize for Excellence in Teaching was shared by graduate students Sahana Balasubramanya and Jordan Nikkel. The award recognizes graduate teaching assistants who have demonstrated concern for and accomplishments in teaching, qualities that characterized the career of former Professor Billy Bryant. In announcing the award, Associate Professor Alex Powell cited the outstanding ratings Balasubramanya and Nikkel received on student evaluations. The Bjarni Jónsson Prize for Research was awarded jointly to Arman Darbinyan and Bin Gui. The prize was established in honor of former Distinguished Professor Bjarni Jónsson and is awarded annually to one or more graduate students for exceptional research in mathematics and outstanding research potential. Darbinyan’s research interests include geometric, combinatorial, and computational group theory; low-dimensional topology; computability and computational complexity theory; and the interplay among those areas. He is the sole author of three research papers, one of which was published in Communications in Algebra. Darbinyan will receive his Ph.D. in August 2018. He will spend the 2018-19 academic year as a postdoctoral fellow at École Normale Supérieure in Paris. Following that, he will assume a three-year postdoctoral position at Texas A&M University. Bin Gui’s research interests are in conformal field theory, subfactors, and vertex operator algebras. He has written two papers studying tensor categories of unitary vertex operator algebras from a unitary point of view. Gui will receive his Ph.D. in August 2018. He has accepted a postdoctoral position at Rutgers University. This year’s Richard J. Larsen Award for Achievement in Undergraduate Mathematics went to Nathaniel Clause. Established in honor of Professor Emeritus Richard Larsen, the award is presented each spring to the senior math major judged by the faculty to have excelled in all aspects of undergraduate mathematics. Rafter noted that the department’s honors track math major requires seven courses beyond the core courses. “Nate took 19 courses, including all the first-year graduate courses,” Rafter said. Clause has been awarded a service-free fellowship to pursue a Ph.D. in mathematics at The Ohio State University. The winner of the 2018 Samir Aldroubi and Amira Azhari Prize for Excellence in Postdoctoral Research was Ben Hayes, who completed a three-year postdoctoral appointment here in 2017. The Aldroubi-Azhari Prize is awarded every two years to recognize the research achievements of current and recent postdoctoral fellows in the department. It was established by Professor Akram Aldroubi in honor of his parents, Samir Aldroubi and Amira Azhari. “Ben was an extremely independent and prolific postdoc,” said Associate Professor Jesse Peterson, who was Hayes’ postdoctoral mentor. “During his tenure here, he either published or had accepted 10 papers, and on nine of them he was the sole author. These were all quite substantial and technical papers, and many of them were accepted in prestigious journals such as International Mathematics Research Notices and Transactions of the American Mathematical Society. Ben is highly deserving of this award.”. Hayes is currently a tenure-track assistant professor at the University of Virginia. His research interests are in operator algebras and ergodic theory, in particular their intersection. He applies techniques from operator algebras and free probability to solve problems in ergodic theory and vice versa. He is also interested in measured group theory and the study of sofic groups, as well as random matrices. The Department of Mathematics is proud to honor these accomplished award winners.